Back on Lens-Artists Challenge #11, Amy was focused on “Small is Beautiful”. This week I’d like to submit that Big can be Beautiful too! 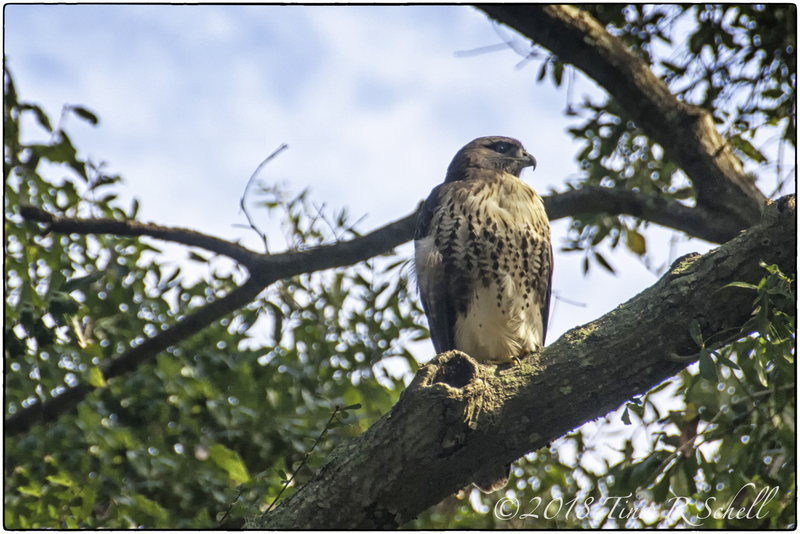 Exhibit A – the gorgeous hawk in my opening image. He visited a large tree next to my home earlier this year and posed nicely until I could get a shot without too many leaves in the way. Speaking of posing, this beautiful peacock was giving us quite a show. I must admit I’d never seen a peacock fly, nor sit in a tree. Typically they’re on the ground strutting their stuff. This male showed us that peacock flight capabilities are actually quite good 😀. Well excuse us for wondering! Now there are those I’m sure who would say an alligator is not necessarily beautiful, but I would beg to differ. They are amazing creatures, built of strong armor and blessed with big, beautiful teeth – the better to eat you with if you are a small animal or an unsuspecting bird. Here on Kiawah, we don’t bother them and they don’t bother us. But a big lens and a bit of distance are very good things where gators are concerned. I’ll close with an image from this past week. 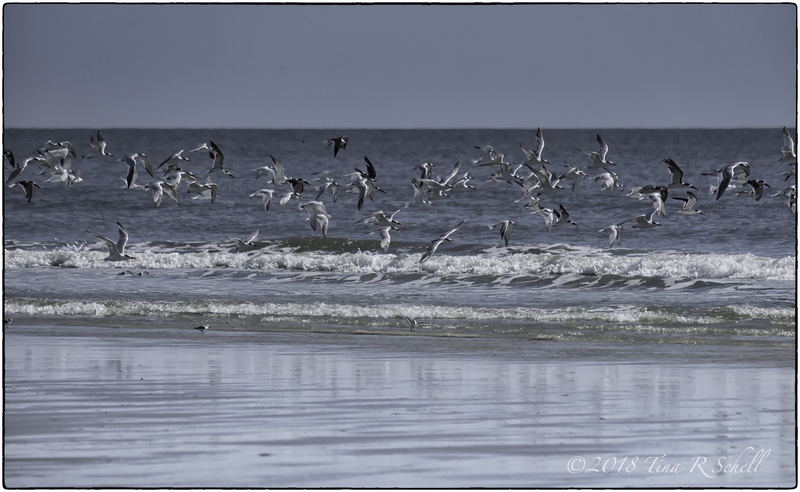 A friend and I were shooting a very large flock of seabirds when they all decided to leave en masse. The tiny little sandpipers looked a bit lost among the large numbers of much bigger skimmers and gulls, but they seemed to hold their own quite nicely. But the MOST fun thing about the shoot was that I was sharing it with a good friend I’d previously known only through blogging. We had a great time connecting in real life vs virtually, and our husbands very much enjoyed the connection too. Whew!! I look forward to seeing your Big Shots (pun intended) this week. Do remember to tag your posts Lens-Artists so that we can all see them in the WP Reader. Be sure to check in with Patti of Pilotfish next Saturday for Challenge #17. For more information about our challenges click here. Amy’s CHANGING challenge last week drew many interesting and creative responses. Amazing wildlife shots Tina. Nothing as big as an alligator here! Thanks MM-they can get up to about 13 ft so while not small, he’ll get bigger still! No worries😊 happy to have you with us! Here’s my post. Really enjoyed this one. That’s strange. I know sometimes it’s the but you have to scroll down. And sometimes it’s not there. Not sure why. Checked this AM and it’s there! And i love your comments! Your photography is breath taking, as always, and I am planning on posting myself soon, but what really got my attention was you meeting a Blogging Friend in person. That is just the BEST! I also got to meet with my favorite friend this year, once at her home in Shreveport, LA and once at mine in Bellevue, WA. Our husbands too. It was so special. And to me, the best part of blogging so far! Thanks for the BIG beauty and for sharing that sweet story! I agree CMP, it was great fun. I’ve met 2 other blogging friends and am seeing another tomorrow. It’s great making virtual friends and having them become real ones! A great, unexpected bonus as far as I’m concerned! I’m featuring some Canadian bigness! Thumbs up on the peacock in the tree. Thanks Paulo-off to check it out! Thanks for joining our challenge this week! Thanks Shelley! He’s a gator, scary but a bit more docile than a croc! No crocs where I live Tina. But because of the warming weather they are starting to move further south. Thanks for joining us Suzy! Well done, thanks for joining us! A surprisingly good choice Anvica! Wonderful blog, beautiful photo’s, Tina! Great challenge, Tina! How far were you from the alligator? Amazing shot! LOL, not quite as far as I should have been!!! 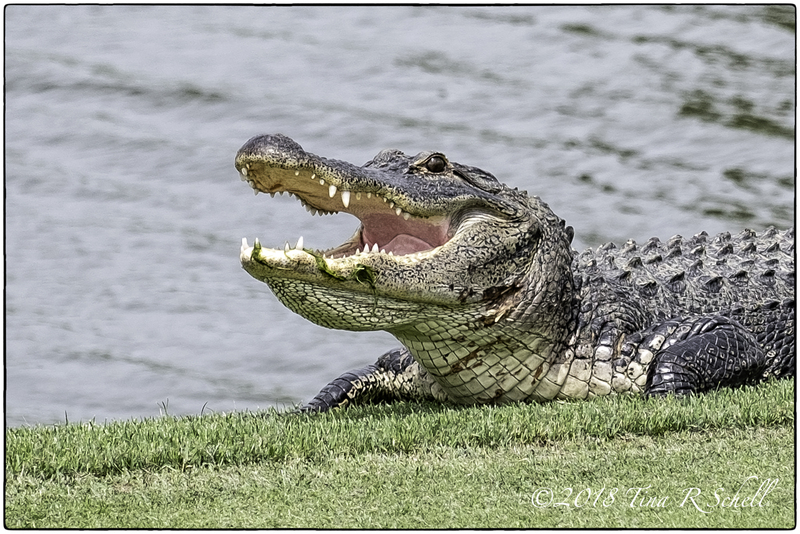 Great shot of the alligator! Such beautiful and diverse wildlife, Tina! Thanks so much de Wets. Quite a compliment in light of your natural environment! 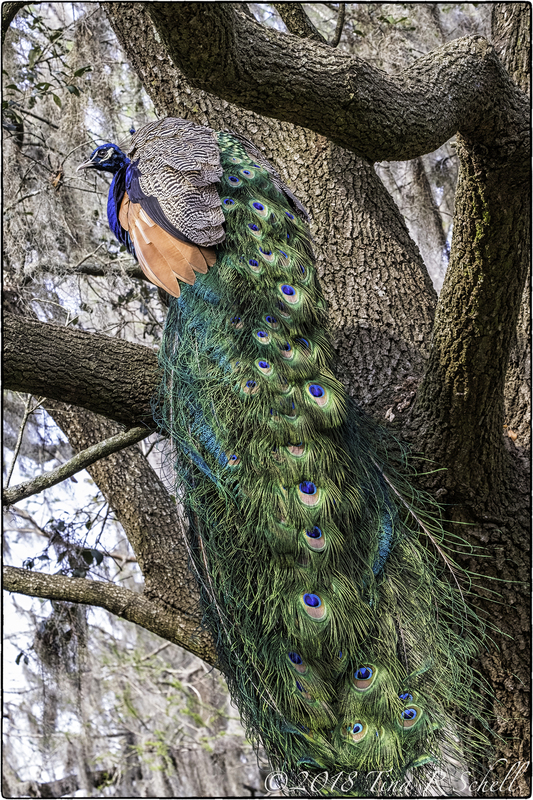 I never realized a peacock’s tail feathers were that long! I adore the last photo though – really a fantastic capture. Thanks very much Gina, that was an amazing moment. BTW Gina – I cannot access your site. When I do I get something foreign (see below). Has anyone else reported an issue? Oh my, such big teeth you have but move over, the peacock is on centre stage. Stunning, Tina! Such a festive appropriate response this week Yvette! Well, here’s my non-itty-bitty entry … Photo taken this past August in the jungles of Chiang Mai, Thailand. Definitely NOT itty bitty Na’Ama! Nope. More like venti yeti! Thanks Laurel – I wholeheartedly agree! I love these two bird captures, gorgeous peacock. The alligator does have good teeth, what a shot! LOL, thanks Lois – thankfully his last meal wasn’t a beautifully-feathered peacock!! I really like all the shots, Tina, but I love the shot of the hawk. I do love them. Thanks Janet – he/she was amazing! I hadn’t realize how very huge they are! I was very happy to be far away from that gator’s big teeth!! Yikes! I enjoyed your “big” collection. Glad all’s well with you too! I’d like to say they’re all talk and no action but nothing could be further from the truth when they are threatened or raising their young. Not unlike humans I suppose! Thanks Patti. Oh, yes. A fiercesome creature! Hope your recovery is bigger and faster than you even hope! Nature has so many stories and creatures to tell them. Big shots here (!) – technology doesn’t always work the way we want to, does it? love that gaitor – never thought I would say or write that…and the surprise peacock! I will see what I can come up with! Thanks Ann-Christine, yes technology…..love it or hate it we must deal with it either way! Glad you enjoyed the gator, I love them. So prehistoric don’t you think? Look forward to your response. Inspired by you and the prehistoric…I have posted mine! Thanks Ann-Christina, looking forward to it! -I saw so many individual vibes with birds in different positions – wings straight up or some arched. Sync with the water lines. Thanks so much Yvette. Looking forward to seeing your response! Beautiful big shots, Tina. Love that hawk and your birds taking off. Thanks Jane – the takeoff was quite the surprise. We were lucky to have been in place an shooting when it happened. Hi Tina it was a late entry but you made up for it being a BIG entry. Glad to see you’re okay; was wondering… Such big teeth you have grandmother, certainly not referring to you Tina or the wolf but the beautiful Alligator. Bedtime in South Africa, I can now go and dream of what to post. 😊 thanks Abrie! Technology issues while traveling. Glad to have reached you before bedtime! !